Is your electricity down? Solar powered generators are an easy way to ensure that your electronic devices have a power source. Simply wheel the generator out to a sunny area to charge, and there you have it! The generator acts as a back up power source for a considerable amount of time to charge your laptops, cell phones, iPods, etc. in times when your home is out of power. 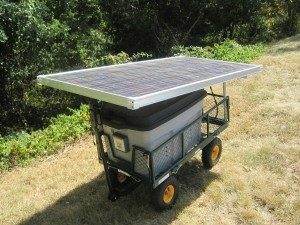 Solar Powered Generators are a great way to do your yard work without the hassle of gas- powering your machines. 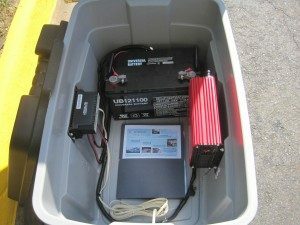 The portability of our generators make them perfect for being used as outdoor electrical outlets or charging stations.Solar system work also work well in boat, here some tips to install marine solar panels in boat. Sizes vary by panel wattage and battery amp hours. 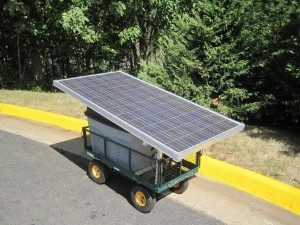 They are made from a simple, effective design that consists of a solar panel connected to a wagon (or wheeled apparatus of your choice) with a closed container holding the DC to AC inverter, a charge controller for juicing up the battery, and one or more batteries depending on the desired usage time. This is easy to use – the inverter has electrical plug-in outlets just like you’d find in your living room. They can be used power electric yard trimmers, camping lights, laptops, festive holiday lights, or pretty much anything you can plug in. They make an excellent learning tool for schools.